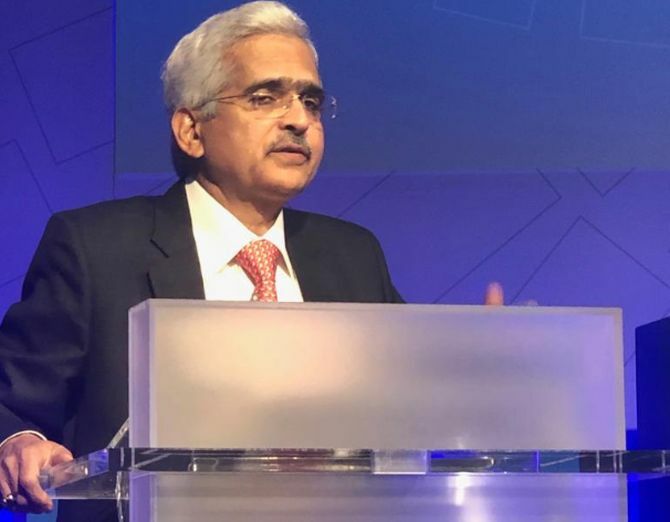 Shaktikanta Das said in Washington, DC, that there was nothing sacrosanct about the 25 bps rate cut and that monetary policy could be well served by calibrating the size of the policy rate to the dynamics of the situation, and the size of the change itself could convey the stance of policy. Reserve Bank of India Governor Shaktikanta Das has asked central banks across the world to think “out of the box” and suggested, for example, that changing policy rates by 25 basis points (bps) or multiples thereof is “not sacrosanct and just a convention”. He said monetary policy could be well served by calibrating the size of the policy rate to the dynamics of the situation, and the size of the change itself could convey the stance of policy. “If the easing of monetary policy is required but the central bank prefers to be cautious in its accommodation, a 10 bps reduction in the policy rate would perhaps communicate the intent of authorities more clearly than two separate moves -- one on the policy rate, wasting 15 bps of valuable rate action to rounding off, and the other on the stance, which, in a sense, binds future policy action to a pre-committed direction,” Das explained, while speaking at the “Governor Talks” programme on the sidelines of the International Monetary Fund (IMF)-World Bank Spring Meetings in Washington. “Likewise, in a situation in which the central bank prefers to be accommodative but not overly so, it could announce a cut in the policy rate by 35 bps if it has judged that the standard 25 bps is too little, but its multiple, i.e. 50 bps, is too much,” he added. Later, in a chat with Changyong Rhee, director of the IMF’s Asia and Pacific Department, Das said he would “rather wait for more reactions, comments and observations from other central banks” on the idea. Asked about structural reforms in India in the past few years, he listed the implementation of the GST and the Insolvency and Bankruptcy Code, among others. “Areas that require attention in terms of reforms would be labour and land. Many steps have been taken already at the provincial level, but much more needs to be done,” he said. “One major area where reforms are necessary in India -- again that is something that lies in the domain of the state government -- is agricultural marketing. We have certain laws related to agricultural marketing, which act as impediments in getting private investments in creation of agricultural markets. As a result, the flow of private capital into creating a value chain in agricultural products from the farm to consumers is getting hampered. The laws are in the domain of the state governments and they need to be completely overhauled,” the RBI governor said. Das said India’s average growth rate of 7.5 per cent over the last few years was very good, but the country needed to grow at over 7.5 per cent. He cautioned that global spillovers of loose monetary policy measures, in the absence of a financial safety net, could be unintentionally forcing emerging market economies (EMEs) to “break out and challenge the hegemony of dominant reserve currencies”. Managing such spillovers, he said, was a formidable challenge for EMEs. “We live in a world of mobile capital flows where consequences of their arrivals, sudden stops, and reversals are to be borne nationally,” he said, adding that while a safety net remained elusive, the strengthening of resources of the IMF got pushed out into time whenever EMEs came together for the Spring or Annual meetings. Das said there was a need for greater understanding on both sides, and assured that the RBI was not contemplating leading the pack of break-out nations. Das’s comments come at a time when the IMF has warned that 70 per cent of the global economy was slowing down, while the rest, led mainly by EMEs, was expected to grow. According to estimates by Bank of England, EMEs contribute 60 per cent to the global growth. At over 7 per cent, India remains the fastest-growing large economy in the world, according to the IMF. He emphasised the importance of interacting closely with financial markets for transmission of monetary policy impulses, which required a sound and efficient payment and settlement system. On the impact of rising oil prices on inflation, he said they played a significant role in the current account deficit, and over a period of time inflationary impact was felt. Will your home loan EMI fall due to rate cut?